In 1749, with the palace display items and court collection of bronzes overflowing, the Qianlong Emperor ordered the officials Liang Shizheng, Ji Huang, and Wang Youdun to imitate examples of bronzes in "Catalogue of Hsuan-ho Antiquities" from the Northern Sung to create exquisite painted copies along with tracings of their inscriptions. In addition, detailed information of 1,500 bronzeware were recorded to produce the "Xiqing Gujian" in 1755. The Jade Vessel Imitating a Bronze Hu with Tubular Handles and the Jade Staff Finial in the Shape of a Pigeon were jades that the Qianlong Emperor had made to rectify what he considered vulgar trends in the new style of jades, which had become popular among the people. He subsequently promoted "imitating antiquity." In order to achieve this goal, he used images of ancient objects found in the imperial catalogue Xiqing Gujian (i.e., the "Vessel with Kui Decoration," found on Page 7 of Vol. 20 and the "Jade Staff Finial in the Shape of a Pigeon," found on Page 25 of Vol. 38, respectively) as "blueprints" for producing the two aforementioned jades. The Vessel with Kui Decoration in the Xiqing Gujian remains in the collection of the National Palace Museum. However, comparisons made using modern scientific archaeological data showed that the year of manufacture was between 14th and 11th BCE (during the late Shang dynasty), even earlier than previously anticipated. Comparisons between the Vessel with Kui Decoration and the Jade Vessel Imitating a Bronze Hu with Tubular Handles show that the latter is skinnier and flatter, which might have been attributed to the limitations of the jade materials used. Nevertheless, the Jade Vessel Imitating a Bronze Hu with Tubular Handles remained one of Qianlong Emperor's favorite artifacts, with which the mark "Qianglong Yuwan" ("For the delight of the Qianlong Emperor") was carved on the wooden bottom of the jade vessel. Similarly, a poem created by the Qianlong Emperor in 1775 was inscribed on the belly of the vessel. 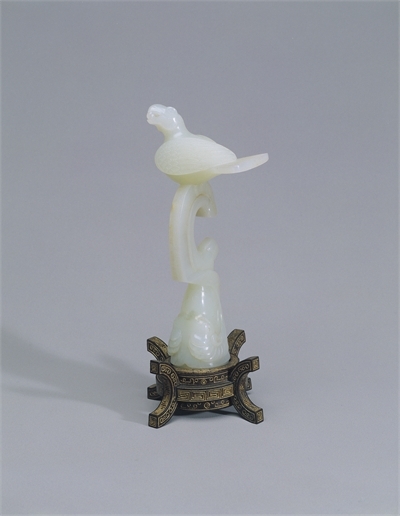 This Jade Staff Finial in the Shape of a Pigeon is divided into three levels. The lower one is a ram's head, the middle is in a "C" shape, and the upper portrays a bird with a bead in its beak. The bird's feathers have been finely carved down to the smallest detail, which is why the Qianlong Emperor appreciated it so much. The stand made for it is also finely engraved underneath with an imperial poem written for it in 1775.